Let’s say for a moment you’re on your way to a holiday party or similar social get-together, and you’ve been tasked with bringing the wine to the evening’s festivities. Trouble is, you wouldn’t know a bottle of the good stuff from an unremarkable glass of plonk. What ever are you to do? You could follow my lead and just pick the bottle that has the most eye-catching label. Or you could consult an expert in the form of WineReviews . 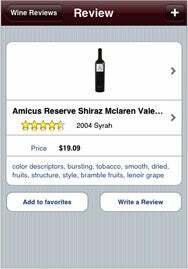 The recently released application from Steve Saxon lets you look up reviews of wines on your iPhone. The $4 application also features a Favorites screen and lets you write your own reviews. Speaking of the holidays, festive apps continue to jam the shelves of the App Store; today, we’ll highlight a pair that have a Hanukkah bent. The $2 iMenorah from Jutanabet joins the ranks of virtual menorah apps from RustyBrick and LilBros. iMenorah lights candles with the touch of a finger, features sung blessings, and promises to donate a percentage of its proceeds to charity. Meanwhile, iDreidle for Chanukah is not made out of clay, but rather is a $1 mobile dreidel game from Gp Imp. just in time for the festival of lights. Finally, we’re a little more than a month out from another significant event—this January’s presidential inauguration. And 2009 Presidential Inauguration Guide figures to help visitors heading to Washington D.C. for the big event. The free app from PointAbout features a countdown screen to Inauguration Day as well as a distance calculator that tells you how far away you are from the steps of the Capitol Building. More important, the app offers info on local restaurants, parking, transit info, and nearby Wi-Fi hotspots. LogMeIn Ignition , from LogMeIn: This $30 app lets mobile users connect to a Mac or PC and control it remotely. Snowdome , from Yotta Digital: The $1 virtual snow globe takes advantage of the built-in accelerometer for the iPhone and iPod touch to cause snowflakes to fly whenever you shake your mobile device. iBreviary , from Dimitri Giani: The $1 app comes in Spanish, French, English, Latin, and Italian offers mobile worshipers the prayer of the Breviary, readings of the Mass of the Day, and other principal Catholic prayers. FriendCast , from CallFire.com: The free application lets you record a message and send it to many contacts simultaneously.